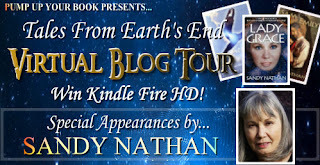 Sandy Nathan is touring September 4 – November 30 2012 with her paranormal fantasy, The Angel & the Brown-Eyed Boy (Book 1 in the Tales From Earth’s End series). Welcome. Tomorrow morning, a nuclear holocaust will destroy the planet. Two people carry the keys to survival: A teenage boy and an intergalactic traveler. Finally it all breaks down. We’re in New York City on the eve of nuclear Armageddon. In the morning, ultimate destructive forces will wipe out all life on earth. Only Jeremy Edgarton, a 16-year-old, tech genius and revolutionary; and Eliana, the angelic, off-world traveler sent to Earth on a mission to prevent her planet’s death, can save the world. Join Eliana and Jeremy as they begin a quest to save two doomed planets … and find each other. When the girl appeared on the sidewalk, the edges of her body and clothing were fuzzy, as though all of her hadn’t arrived. She looked up and down the street, the way a person would if she’d forgotten an address or lost her way. Her hair was frizzed and matted, sticking out akimbo. She was thin, had a dirty face, and wore a scratchy coat that was far too big. Its sleeves were rounded little capes; her arms stuck out of them like chopsticks protruding from a napkin. The coat slipped off her shoulders, first to one side, then the other. She hitched it up and kept walking. When she walked, the coat opened to reveal her feet and lower legs. Her thin socks, trimmed with grayed lace, were pulled up to make a ruffle below her knees. Pink satin laces held up the socks, their Xs snaking up her shins from her shoes. She looked pretty much like everyone she saw, except for her shoes. Long pink ballet slippers stuck out from beneath her coat, as improbable as roses sprouting from the cement. Eliana made her way along the sidewalk, knowing that she was dirty, feeling the grit in her hair and on her skin. When she had reached the planet’s atmosphere, clothes and all sorts of things had rushed at her with great force, tossing her over and over. Dirt had come, too. She had found the clothes she needed and put them on the way her teachers had shown her. Then her people had put her where she was. Humans passed, but no one stopped or said anything to her. A paper blew against her leg. More dirty papers blew and piled up everywhere. Streaked and grimy buildings rose near her. Writing in different colors covered their walls. She looked carefully, but couldn’t make out the words. She’d learned to read and write English, but those words mystified her. “Hey, you!” a person said loudly. “Yes?” She spoke to a human for the first time, politely bowing. The human was dirty like Eliana, with torn clothes and matted hair. She couldn’t tell if it was a he or a she. “Get out of here!” the ragged person shouted. “You don’t belong here.” Eliana cowered, but the stranger rushed past her, clawing at something Eliana couldn’t see. “Stay away,” the human said, and then stood with feet braced, shouting, “Get out of here, all of you. Stay away!” The human hadn’t seen Eliana at all. The girl realized that her people were right; they had put her where no one would notice her. Now she needed to tell them that she had arrived. She raised one foot, turning it gracefully and resting it easily on the other knee. She flicked the shoe with her finger, listening. A trill of clear notes deep within her brought the hint of a smile. She held the coat closed and stood still. She was where she was supposed to be. It had begun. She fingered the piece of paper in her pocket. Her map. Beneath it, in the pocket’s depths, was the notebook. What was written on it would get her where she needed to go. She had all she needed. She walked a long way along the hard path. More humans passed her. To her left, gray, inert structures rose high in the sky, blocking the sun. She touched the see-through parts of their lower levels, looking at the humans inside. They looked at each other with darting eyes, speaking rapidly. Everyone outside rushed frantically, noticing nothing. They didn’t see her, just as her people had said. Eliana choked when a very large carrier passed, spewing a foul odor. The carrier floated above the hard surface where the vehicles moved. Her teachers had told her about the floating. Though she couldn’t see it, a force lived under the machines that made them go. It would kill her if it touched her. She didn’t know what kill meant; kill did not exist in her world. Her mother had explained that she would be like a dead pet. She had seen dead pets before they whisked them away. Motionless husks. She moved away quickly. Better get on with her purpose. She didn’t have much time. A man with a round stomach and a gray hat walked out of an opening in the ground with many others. He walked like he had a mission. His coat was the same scratchy stuff as hers, but it was buttoned up and looked new. He looked new; his face was ruddy and clean. His shoes reflected the pale sunlight. The trill of notes resounded in her mind once again. He was the one! She stood in front of him to make him stop. She hoped he could comprehend her speech. “Will you help me?” she said, working to form the strange words. Sandy Nathan writes to amaze and delight, uplift and inspire, as well as thrill and occasionally terrify. She is known for creating unforgettable characters and putting them in do or die situations. 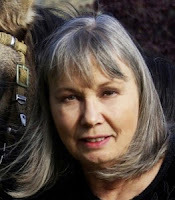 She writes in genres ranging from science fiction, fantasy, and visionary fiction to juvenile nonfiction to spirituality and memoir. Mrs. Nathan’s books have won twenty-two national awards, including multiple awards from oldest, largest, and most prestigious contests for independent publishers. Her books have earned rave critical reviews and customer reviews of close to five-star averages on Amazon. Most are Amazon bestsellers. Sandy was born in San Francisco, California. She grew up in the hard-driving, achievement orientated corporate culture of Silicon Valley. Sandy holds Master’s Degrees in Economics and Marriage, Family, and Child Counseling. She was a doctoral student at Stanford’s Graduate School of Business and has been an economic analyst, businesswoman, and negotiation coach, as well as author. Mrs. Nathan lives with her husband on their California ranch. They bred Peruvian Paso horses for almost twenty years. She has three grown children and two grandchildren. Her latest books are The Angel & the Brown-Eyed Boy, Lady Grace: A Thrilling Adventure Wrapped in the Embrace of Epic Love and Sam & Emily: A Love Story from the Underground, which are all part of the Tales from Earth’s End series. 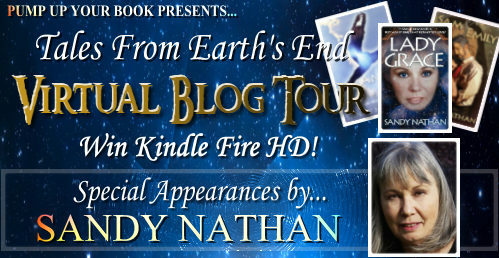 Pump Up Your Book and Sandy Nathan are teaming up to give you a chance to win a new Kindle Fire HD! 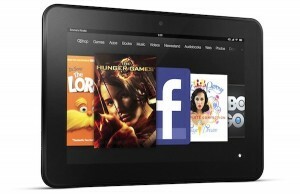 This Kindle Fire HD promotion will run from September 4 – November 30. The winner will be chosen randomly by Rafflecopter, contacted by email and announced on December 1, 2012. Hi,everyone! This is Sandy Nathan, author of The Angel & the Brown-eyed Boy, today's book. I'm also the author of the Tales from Earth's End Saga. The Angel is the first book of the Saga. If you follow along on my tour, you'll get to know the other two books. Hope you enjoyed the info above. I would love to win the Kindle Fire because right now I'm reading all my ebooks on my old laptop that keeps crashing, and shutting down, and losing info. I would love to win the Kindle Fire because Amazon always has exclusive ebooks that look amazing and I don't want to read them on my computer. Also - I would love to use all the other awesome features! Gift to my husband, then he wouldn't have to keep taking my kindle! Hi, everyone! This is Sandy Nathan, author of The Angel. I wish you could all win the Fire so you could read my books. I've six out, including the Tales from Earth's End Saga. They're all on Kindle. We're putting out a HUGE file––a "boxed set" of all the Tales books. That's coming soon. Before Christmas. It would be great for traveling.